Their journey began on June 5th, as many eager students took their first-ever steps on a plane! From the Halifax airport, the class immediately set off for Nova Scotia’s northwest coast where they spent the night camping at the UNESCO World Heritage Site - Grand-Pré National Historic Site. This site is picturesque and commemorates the vibrant culture and the tragic history of the Acadian people. After this culturally enriching experience it was time to wave goodbye and begin their next exploration. Fort Anne was established in 1917 and is Canada’s first National Historic Site with a long history full of settlement and conflict. This is where the students enjoyed playing cricket, exploring the Fort, and participating in a document conservation workshop. Next up, the class travelled to nearby Port-Royal National Historic Site where they were served up a traditional feast just like the French settlers might have experienced. The class dined and later slept in Port-Royal’s Habitation, one of North America’s oldest European Settlements. After dinner, the class gathered in a wigwam to learn a Mi’kmaw song and try their hand at drumming. They also learnt some woodworking and shingle making with costumed interpreters and got a glimpse life in the 17th Century. After sunset, the group headed back to Fort Anne and were treated with a candlelit tour of the 300-year-old Garrison Graveyard, home to Canada’s oldest English gravestone. The next leg of this incredible all-expenses-paid trip lead to the wilder side of Nova Scotia. On their third day, the class explored the trails that wind through the Acadian woodlands and freshwater streams of Kejimkujik National Park and National Historic Site. This area is unique as it contains evidence of about four millennia of Indigenous presence. It was a site for seasonal camps, fish weirs, hunting territories, portage routes, and burial grounds. The grade 8 class learnt about unique aspects of the Mi’kmaw culture such as their use of birch bark to form almost everything from shelters and canoes to baskets and moose bugles. The Mi’kmaw would also carve petroglyphs into the stone depicting things like traditional clothing or ocean-going canoes. Students of Lethbridge even got the chance to try their hand at using an atlatl, a tool for throwing darts and spears for hunting. That night, students cooked their own dinner over the campfire, drank traditional herbal tea and told stories as they watched the last light fade from the horizon and stars fill up the sky. The fourth day of Canada’s Coolest School Trip brought, yet again, new places to discover. An exciting visit to Peggy’s Cove: home to one of Canada’s most famous lighthouses, smooth white rocks, rustic villages, piles of lobster traps and colourful boats bobbing in the bay. The next stop was the Halifax Citadel National Historic Site. It was here that the students learned about the history of the fortress and even got to have a feel for what is was like to be a soldier in the 1800s. 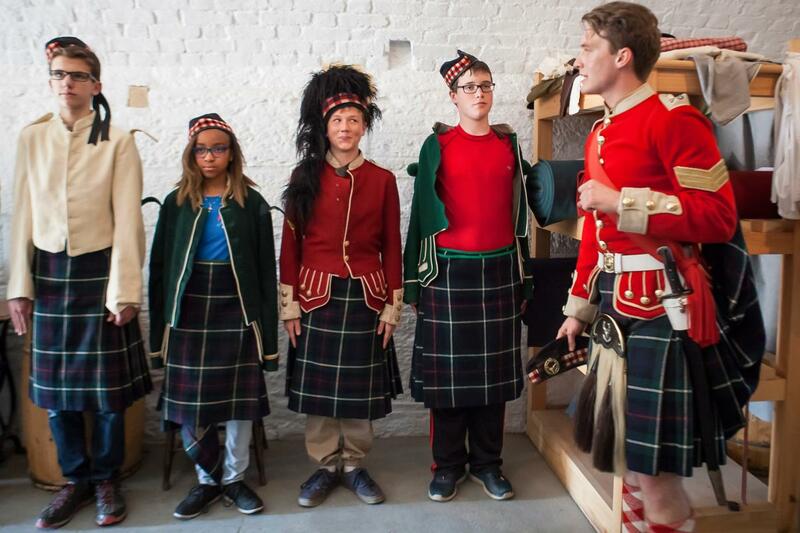 Students had the opportunity to dress up in period clothes and receive a brief military training as they stood at attention in their green and blue tartan kilts. Next, a cannon was rolled to the edge of the fort and loaded with gunpowder as one ear-deafening shot rang out to end the night. Before saying goodnight to the beautiful starry sky, students went on a guided ghost walk of the Citadel. On the final day of the trip, the Maritime Museum of the Atlantic was visited by the students as they toured the Titanic exhibit, used telescopes and learnt about the international naval flag system used by ships. To complete their journey, students got the chance to explore downtown Halifax in the pouring rain - quite the authentic experience. As the class waved their final goodbyes to Halifax later that day they remembered all the new and incredible experiences shared together. It is safe to say they won’t be forgetting this trip any time soon and Nova Scotia will always stay close to their hearts.